Discover the best of Cambodia and Vietnam with time exploring the temples of Angkor and an overnight junk cruise on Halong Bay. With this itinerary, ancient history and spectacular scenery combine to give you the highlights of the region. Upon arrival in Siem Reap Airport, you will be met by our tour guide and proceed to your hotel for freshen up. This afternoon you will visit the monumental magnificence of Angkor Thom – the last capital of the great Khmer Empire. 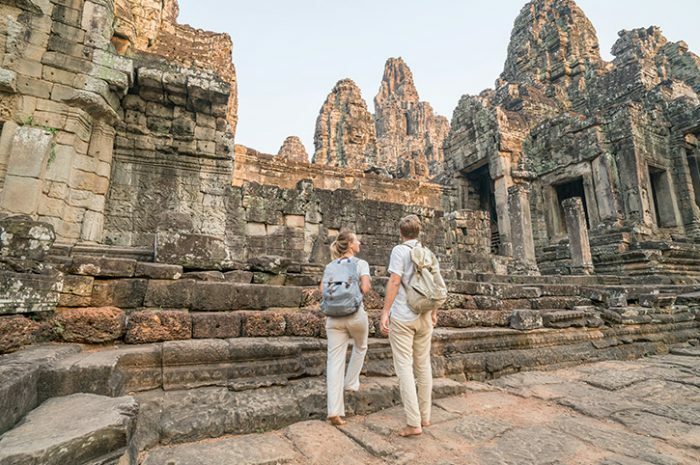 You will visit the sprawling Elephant Terrace, the Terrace of the Leper King and the enchanting Bayon. 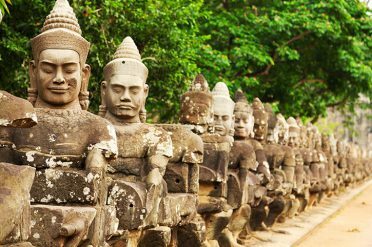 This 12th century masterpiece lies at the very centre of Angkor Thom City and is an archaeological wonder of symmetry and grandeur. The exterior gallery walls have extensive bas-reliefs but the main features are the towers each with 3 or 4 gently smiling faces, over 200 in total. Enjoy sunset at Angkor Wat Temple. This afternoon, visit Ta Prohm, built in the 12th century the temple that has been left largely in its natural state since its “re-discovery” by French explorers. Surrounded by jungle, its labyrinth of stone hallways is overgrown with the roots and limbs of massive banyan trees, which envelop the stone like tentacles and giant claws. Continue to Preah Khan, “The Sacred Sword”, an extensive monastic complex covering over 56 hectares built by the Khmer King Jayavarman VII as a monastery and teaching complex. Preah Khan is the site of the World Monuments Fund ‘prime’ Asian project a painstaking renovation whilst maintaining its mysterious allures and superb original structure. This morning, visit Banteay Srei; ‘the Womans Citadel’ – a tiny, enchanting temple, which is one of the jewels in this remarkable city. Built of red sandstone in the tenth century and dedicated to the Hindu god Shiva, the carved male and female figures in the niches are exquisitely executed in both style and proportion. This is the most Indian of all the temples in Angkor and in the words of H.W. Ponder, is “a fairy palace in the heart of an immense and mysterious forest.” Continue to Banteay Samre, built in the early 12th century, it is a Hindu temple in the Angkor Wat style. Named after the Samré, an ancient people of Indochina, the temple uses the same materials as Banteay Srei. This afternoon visit Tonle Sap Lake which is the largest fresh water lake in South East Asia and is the heart of the Cambodian fishing industry and the lifeblood for millions of Khmers living on and around it. Every year during the monsoon season the flow of water from the Mekong River changes direction forcing water back into the Tonle Sap lake bringing nutrients that fertilise the rice fields and support the breeding of the 200+ fish species and other life. You will board a comfortable boat to see the true way of life in one of the floating villages of the Tonle Sap, here you can see how Khmers and Vietnamese live and work side by side. Visit to a development project teaching young adults, stone carving, wood carving, lacquer application. Artisans d’ Angkor is a heart warming reminder that progress in Cambodia can go hand in hand with traditional crafts. After breakfast, our tour guide will pick you up from your hotel and drive to airport for your flight to Phnom Penh. Upon arrival in Phnom Penh Airport, you will be met and transferred by our Tour Guide and proceed to your hotel to freshen up. This afternoon, visit The Royal Palace built in 1866 by King Norodom; the Palace is made up from a number of structures within a pagoda-style compound one of which is The Silver Pagoda. The Silver Pagoda takes its name from the 5,000+ silver tiles and the building itself holds a number of national treasures perhaps most notably are a life-sized gold Maitreya Buddha decorated with 9584 diamonds, weighing in a at 90 kg and a small 17th century Emerald Buddha made from baccarat crystal. Continue to visit the National Museum, a Khmer temple inspired building that houses the world’s largest collection of Khmer art sculptures, ceramics and bronzes from different periods of Cambodian history. Over 5000 objects are on display including Angkorian era statues, lingas and other artifacts, most notably the legendary statue of the ‘Leper King.’ Though the emphasis is on Angkorian artifacts, there is also a good collection of pieces from later periods, including a special exhibition of post-Angkorian Buddha figures. After breakfast at hotel, visit to the Toul Sleng Genocide Museum and Cheung Ek is essential for a first time visitor to Cambodia. During the Pol Pot regime, Toul Sleng, formerly a high school was converted to a detention centre known as S21. 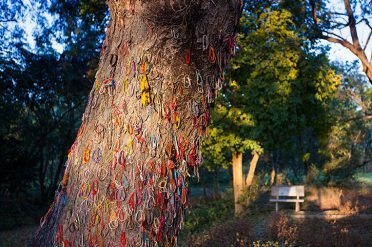 After interrogation and often torture, prisoners were transferred to ‘Killing Fields’ where they were often tortured again and brutally killed. Free at leisure until transfer to airport for your departure flight. Saigon is surely one of the most evocative place names in Asia and definitely one of the most extraordinary cities in the world. The most Western in atmosphere of Vietnam’s cities, Ho Chi Minh City (to use it’s official name – although to residents and visitors alike it is universally and affectionately known as Saigon) has a population of 5 million, and a booming free-market economy. It is a city of amazing contrasts: elegant new international hotels, exclusive restaurants and trendy bars side-by-side with roadside noodle stalls, street children and vociferous cyclo drivers. Golf courses, bowling alleys and shopping malls vie for space with fruit and vegetable markets, pagodas and karaoke rooms. Bustling, booming, crowded, noisy – all words that barely scratch the surface of the addictive and often mesmerising chaos that is Saigon. And yet there are the elegant colonial French boulevards and buildings, the Cathedral, the riverfront, the quiet moments at a sidewalk cafe watching the world literally go by you at breakneck speed. Saigon. A city that is almost indescribable and completely unforgettable. Visit the former Presidential Palace, which is now preserved as a museum, including the underground communications bunkers, headquarters for the Saigon Government during the American War. Continue to the History Museum, which houses an excellent display tracing the origins of the indigenous Vietnamese. A water puppet performance is housed in the grounds. See Notre Dame, an impressive neo-Romanesque cathedral in the centre of city, the ‘wedding cake’ styled hotel d’ville and the former US Embassy. Lunch will be taken in local restaurant – then journey to Saigon to Cu Chi, Chi where you will visit the vast underground network of tunnels built first as a defence against the French, and later expanded during the American war. It was from here that the North Vietnamese waged their guerrilla warfare and you will marvel at their ingenuity and resilience. See secret trapdoors, underground kitchens, living areas and meeting rooms. The more adventurous may explore the deeper second, and even third level tunnels. For those preferring to remain above ground, there is ample opportunity to view excavated areas from above. Your guide will advise you of the length and level of difficulty of each tunnel before entering – some are easily accessed by stairs. We recommend good walking shoes and sun protection for this tour. Leaving Saigon today to travel the bustling highway into the surrounding countryside where you will pass lush rice paddies carefully tended, before boarding your motorised sampan for a unique experience on the mighty Mekong Delta waterways. You will see how, to the people of Delta, the water is a lifeline – the focus of all daily activity – as you journey through a maze of tributaries and fruit plantations. Enjoy a sample of delicious fruit in the shade of a fruit farmer’s garden before continuing via small canals on a sampan and on to lunch, where the speciality is a remarkable dish of ‘elephants ear fish’. Return to Ho Chi Minh City by the late afternoon. A short one hour flight brings you to Danang. One of the most ancient cities in Vietnam, Danang was the centre of the Cham Dynasty from the 2nd century and today boasts the largest and most impressive collection of Cham artefacts anywhere in the world. Danang’s rich cultural history, its proximity to the extraordinary ruins of My Son, its atmospheric riverfront promenade, its world-famous Cham Museum all continue to draw visitors. Close by Danang is China Beach, immortalised for many by the US television show and still one of the most spectacular beaches in Asia. Also nearby are the Marble Mountains, the 5 craggy limestone peaks that are said to represent the 5 elements of the universe. A climb inside through the hundreds of natural caves and grottoes is a must. This morning, you will take a walking tour of Hoi An including lunch at one of the many nice restaurants. Hoi An is an extraordinary jewel of a town. In a country so ravaged by war, Hoi An managed to remain untouched, and as you wander the completely traffic-free streets of this ancient seaport it is not hard to imagine yourself amidst the sailors and merchants of the 18th century, when Hoi An was one of the busiest trading ports in Asia. Lunch will be served at local restaurant. This afternoon you will visit the small village of Cam Ha by boat from Hoi An and, because of its isolation, has retained traditions that have long since been modernised elsewhere in the world. On disembarking your simple, but comfortable boat, you will wander the well-trodden track to the village centre. At every turn you will see the remarkable tenacity of the local people as they perform the backbreaking labour of their craft that has been handed down through generations. Courtyards are lined with hand cut bricks, drying in the accommodating sun. Village elders turn the potting wheels whilst their children shape vase after bowl after plate from the supple clay. The village of Cam Ha is a truly remarkable example of a simple life, unfazed by the hustle and bustle of the modern world. Return to your hotel for dinner at your own expense. Enjoy breakfast at hotel then you will have full day is free at leisure. Perhaps retrace your steps to some of the town attractions, or spend a day by the beach. This morning, you will take an overland transfer by road along Highway One and over the spectacular Hai Van Pass to Hue, stopping for lunch at a local restaurant. 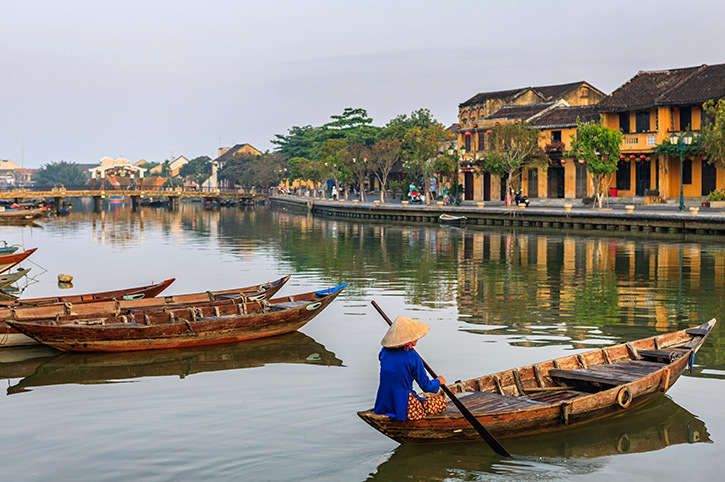 Visitors to Hue are often taken aback to discover that the sleepy provincial town of Hue was once the religious, economic and cultural epicentre of Vietnam, the mighty Imperial headquarters, and the political capital of the country until 1945. That this glorious architectural masterpiece of a city should have been reduced almost completely to rubble as a result war is indeed a tragedy in the truest sense of the word. Thirteen Nguyen Dynasty Emperors ruled Vietnam from Hue. They built a fortress around the ancient city, a huge Citadel, with walls 10 metres thick, modelled on Beijing’s Forbidden City. Even this seemingly impenetrable defence though was useless during the Tet Offensive of 1968, when the proud city of Hue was reduced to ruins. Hue today has regained it’s royal demeanour and is a calm, peaceful and relaxed place to visit. The remaining French colonial garden houses and villas, the quiet streets, the riverbanks, the outlying tombs and pagodas that escaped damage – all give Hue a unique atmosphere of tranquillity. In the afternoon, you will take a boat trip on Perfume River to Thien Mu pagoda and also Imperial Citadel. One of the most famous sights in Hue- the Thien Mu Pagoda. 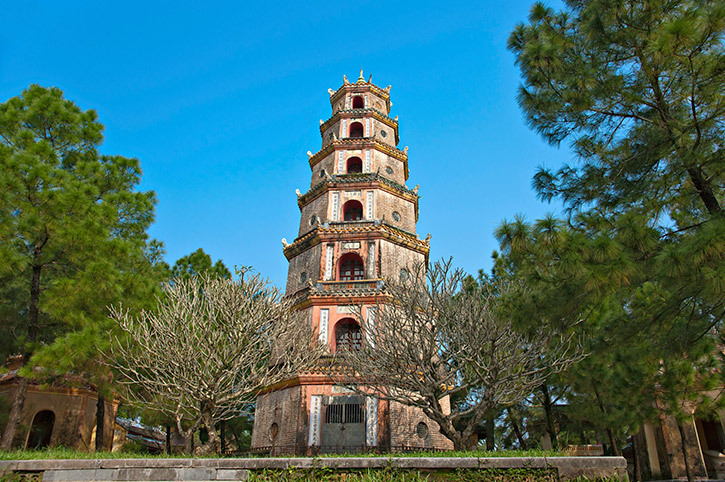 An octagonal tower of seven tiers rises majestically over the tranquil Perfume (Huong) River. Beyond you may see robed monks chanting their mantra, or novices carefully tending the bonsai garden. Then, continue to visit the Imperial Citadel, which has a 10km perimeter, was built in 1804 by Emperor Gia Long (the first Nguyen emperor) on a site chosen by geomancers. It was originally made of earth, but during the first few decades of the 19th century, tens of thousands of workers laboured to cover the ramparts, built in the style of French military architect Vauban, with a layer of bricks 2m thick. In the morning, continue to visit Tu Duc Tomb, Minh Mang’s tomb. The tomb of Emperor Tu Duc, resplendent in traditional architecture, paved walkways, resting pavilions overlooking tranquil lotus ponds, and a small forest for hunting. 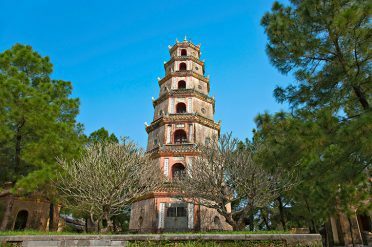 Then visit the tomb of Minh Mang which was built between 1841 and 1843 and is well known for its harmonious blend of architecture and natural landscape. Transfer to the airport for noon flight to Hanoi with afternoon flight/early evening flight. Arrive Hanoi, our car and guide will transfer you to your hotel in downtown where you will stay on the last two nights in Vietnam. In the morning, you will visit Ho Chi Minh’s complex followed by lunch in a local restaurant. 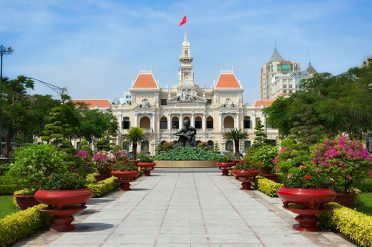 Visit Ba Dinh Square, where silent sentries guard the marble and granite mausoleum where Ho Chi Minh lies in state. (Subject to opening times the interior of the mausoleum can be visited). See the simple cottage where Uncle Ho lived and worked, Nearby, visit the Ho Chi Minh Museum, an extraordinary tribute in abstract form to the life of the ‘father of the country’ and the evolution of Vietnamese independence. French architecture is a feature of Hanoi, and the nearby former Governor’s Residence is a fine example. See also the One Pillar Pagoda, and hear the legend of its construction, born from the love of an emperor in the 11th Century. After lunch you will continue to visit some of the highlights of Hanoi. Enjoy an orientation of the tree-lined streets of Hanoi, resplendent with French colonial architecture, including the recently restored Opera House. Pass by Hoan Kiem Lake, also known as Lake of the Restored Sword from the legend that surrounds it en-route to one of the city’s fascinating museums (Army, History or Fine Arts, depending on your preference). Continue to the Temple of Literature, built in 1070 and then dedicated to Confucius, it is a serene retreat from the busy streets outside, and later became Vietnam’s first university. Then take to the streets on foot for a walking tour of the Ancient Quarter or 36 Streets District. This densely populated corner of the city was once a centre of commerce where goods were sold under the street name of a particular guild. Still a thriving community of sellers today, you will see street names such as Sugar Street, Tin Street and Paper Street. Ancient homes and temples are interspersed with stores in this souvenir hunter’s paradise! After breakfast we depart at approx. 8am and transfer by road to Halong Bay, approximately 3 – 3.5 hours drive north of Hanoi. 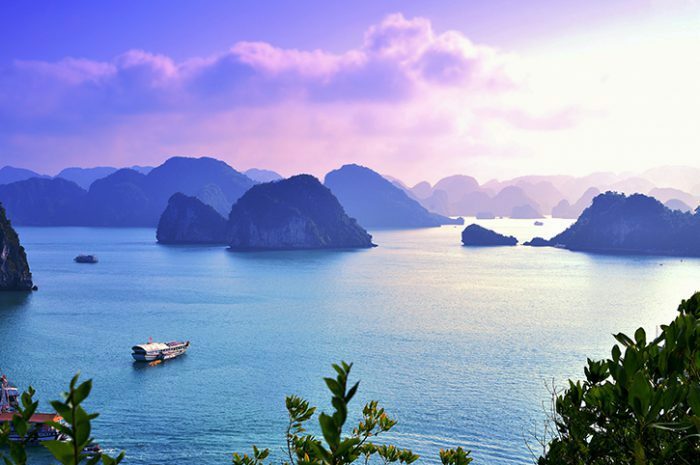 Halong Bay is considered Vietnam’s eighth wonder of the world – and on arrival it is easy to see why. Three thousand spectacular chalk and limestone outcroppings, cliffs, arches, and coves form a dragon’s tail across the bay. Traditional sailing junks and local fishing boats glide by selling their latest catch. A Halong Bay cruise onboard the Bhaya offers luxurious elegance amid the splendour of Vietnam’s premier cruising attraction. Styled after the Emperor’s grand junks, all Cabins and Suites are finished in traditional Vietnamese hardwood giving them a rich, luxuriant warmth. Hand-crafted hardwood furniture and gold and white fittings, further enhance the warmth and light. After boarding the Bhaya Cruise boat at approximately 12 noon, enjoy a welcome drink and begin cruising on the bay. A Vietnamese buffet lunch is served on board. Whilst cruising on the emerald green waters of the bay you have chance to enjoy the magnificent scenery and to visit a selection of islands and caves. If weather permits there is also the chance to enjoy swimming, snorkelling or kayaking or to relax on-board and enjoy the views or socializing with your fellow passengers. Early this morning there is the chance to practice Tai Chi skills on the sundeck whilst the sun rises over the bay. A buffet breakfast is served as the Bhaya continues cruising through Halong Bay, allowing guests a last chance to enjoy the spectacular views of this unique seascape. At approximately 11am the Bhaya returns to shore, and after disembarking you will transfer by road back to Hanoi and then transfer to the airport for evening departure flight. All prices are per person, based on 2 sharing a twin room, and include meals where shown. Talk to an Asian Expert for departure dates and availability. Touring at its very best with a private driver/guide and vehicle. Plus time to explore at your own pace.